DEET (N,N-diethyl-meta-toluamide) is a wonderful product! On several trips to the jungles of the Amazon as well as countless hikes here in the Deep South, I have found this bug repellent to be just the thing to keep biting insects at a safe distance. DEET was introduced by the U.S. Army as an insecticide back in the 1940's and has been one of the most popular bug repellents commercially available. Yes, DEET is a wonderful product to use - unless you are concerned about the fact that it is toxic to the liver and is now being implicated as a potential neurotoxic poison. Research published in the journal BioMed Central Biology, reports that DEET, which works by interfering with the nervous system of insects and potentially can have the same effect upon people. On the flip side, there have been reports that the mosquito, Aedes aegypti which spreads Yellow Fever has begun to show resistance to the active ingredients in DEET. Thankfully, nature has a host of answers to the dilemna of how to safely repel biting insects. The wild shrub known as American Beauty Berry, Callicarpa americana may just prove to be the safe and naturl alternative. 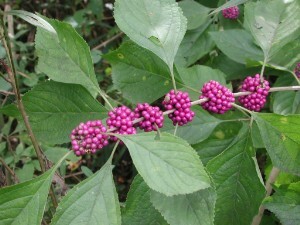 In the South, espcially in the mountainous northern areas of Alabama, Mississippi and Georgia, one of the old ways of keeping biting insects off horses and mules as they plowed, was to place the branches and leaves of Beauty Berry under their collars. I remember Tommie Bass talking about this as well as using clumps of wild Mountain Mint for the same purpose. Researchers at the United States Department of Agriculture-Agriculture Research Service managed to identify several chemicals in Beauty Berry which seem to hold the key to its activity - callicarpenal, intermedeol and spathulenol. Preliminary testing also indicates that these chemicals are as effective as DEET in repelling insects without the potential adverse side effects to the liver and nervous system. Beauty Berry is very easy to use. If you are out in the woods, simply grab a branch, crush the leaves and rub over all exposed skin. I have found this to work very well. Insects will still buzz around me but don't land. An even better way of using the plant is to take the leaves and berries if you want, place them in a pint jar and cover with rubbing alcohol. Leave for a couple of day and then strain off the leaves. Place in a spritz bottle, add a drop or two of some nice "smelly" body wash if you want and then carry this with you on camping trips or hikes. Since this is made with Rubbing Alcohol, it is not intended for internal use. The spray does not last as long as DEET and requires more frequent applications. Beauty Berry seems to be more effective for flying insects than it is for ticks. It is reasonably effective as a tick repellent but I would still do a thorough tick check after getting out of the woods. Of course, even using DEET, I would still consider this a good thing to do.